If you enjoy nature and the little (and sometimes not so little) creatures that live in it – wildlife watching can be an extremely rewarding pastime. For wildlife enthusiasts – trail or game cameras provide an excellent way to document and view animals, especially the shy or rarely seen. This not only provides a safer way to view some species (bobcats, ocelots and Mountain lions to name a few), it also allows us to view the animals without disturbing them or their natural behavior and environment. Many trail or game cameras take quality digital images and have night time shooting capabilities. Many cameras produce images that have information about the temperature, moon phase, time, barometric pressure, date and the camera that the picture was taken with included right on the photo itself!. Game or trail cameras provide a much better option for observation by allowing the animals to interact naturally – and potentially landing some amazing images of wildlife in action! Wildlife watching is not necessarily limited to the forests, deserts, swamps or mountain ranges around our homes – there’s great wildlife watching to be had even closer – right in our own backyards! Wildlife cameras in your backyard can be positioned in bird boxes, mounted on the side of a house/shed or ground mounted to capture footage of animals at every level. 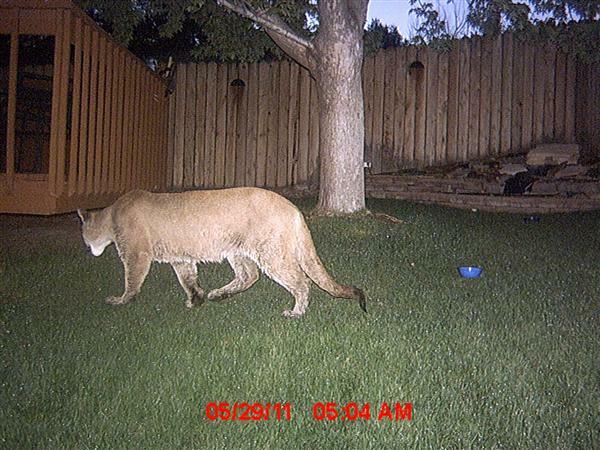 You might end up surprised at what walks through your backyard when you’re not around! Something a little larger than expected caught on a backyard game/trail camera!